Happy birthday Singapore! 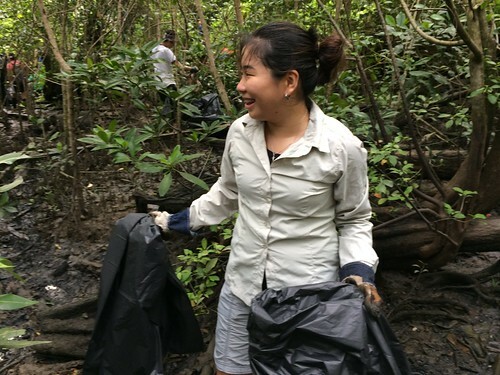 From 90 volunteers who celebrated with a mangrove cleanup! 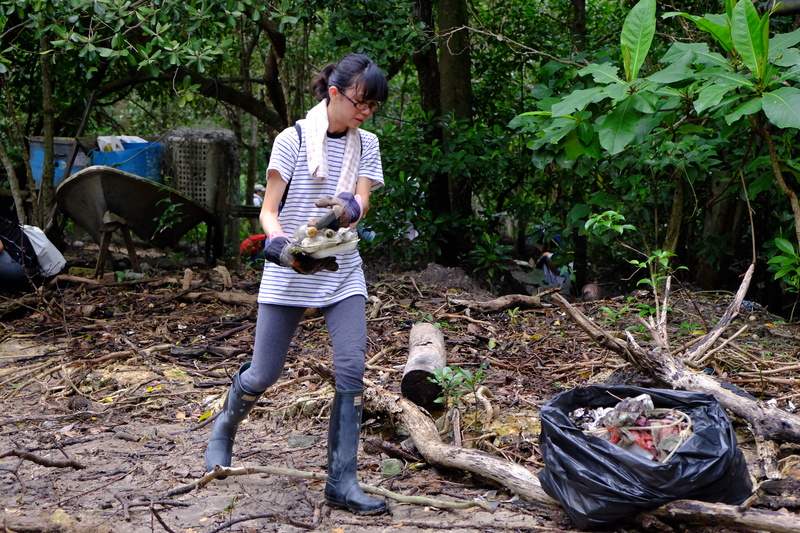 Once again, members of the public joined NUS Toddycats in commemorating National Day by coming together to clear marine trash from our precious mangroves – 90 volunteers cleared half a tonne of trash (573kg) in 103 trash bags from Lim Chu Kang East mangrove this year. 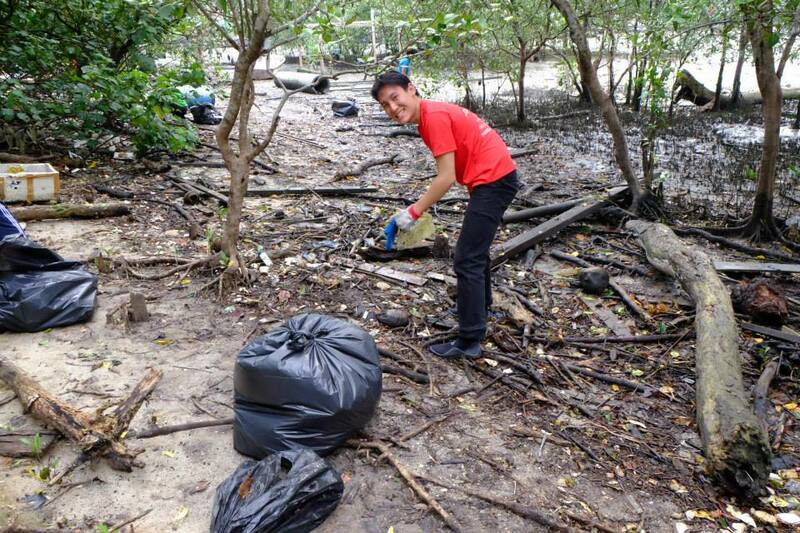 The cleanup was relocated to this tougher site as our usual site at Lim Chu Kang beach and mangrove has received enough tender loving care of late that it remains relatively clean – encouraging news indeed! 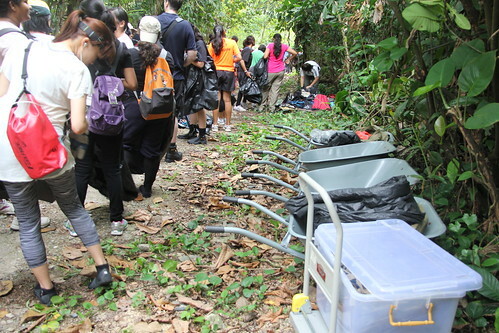 Before the buses from Kranji MRT with most of the buses arrived, a pre-cleanup check of the site was conducted. We identified two beautiful mangrove pit vipers in LCK East mangrove and marked off the area to ensure they would not disturbed by the cleanup crew. 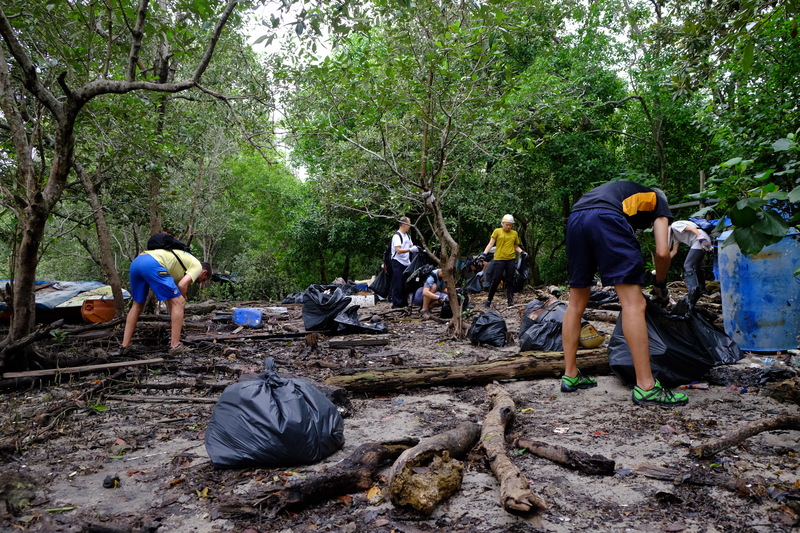 The 90 volunteers were sorted into groups of 10 led by team leaders who were pushed through four insertion points into Lim Chu Kang East mangrove, slowly and carefully. Many hands make light work indeed and the small groups working hard amidst the vegetation also ensured we minimised our impact to the site. We would not clear all of the trash that morning but the ICCS cleanup in September would take care of the rest. Meanwhile, it was good to realise see that the mangrove plant cover had improved considerably in LCK East mangrove. 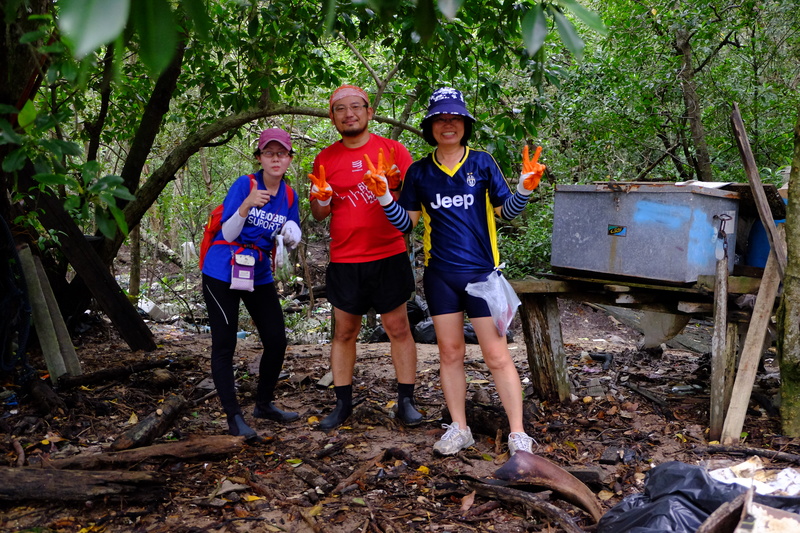 I was really happy that I had NUS Toddycats with me – eleven of these experienced field biologists led small groups of volunteers deep into our plastic-ridden but precious LCK mangroves. Thanks to Amanda Tan, Xu Weiting, Kenneth Pinto, Yang Yi Yong, Fung Tze Kwan, Tan Chia Wu, Tan Kai Scene, Airani S, Adriane Lee, Teo Kah Ming & Theresa Su; also Joys Tan for handling pre-cleanup logistics. It was a delight to see Sonneratia alba sprouting on the northern stream bank once again! 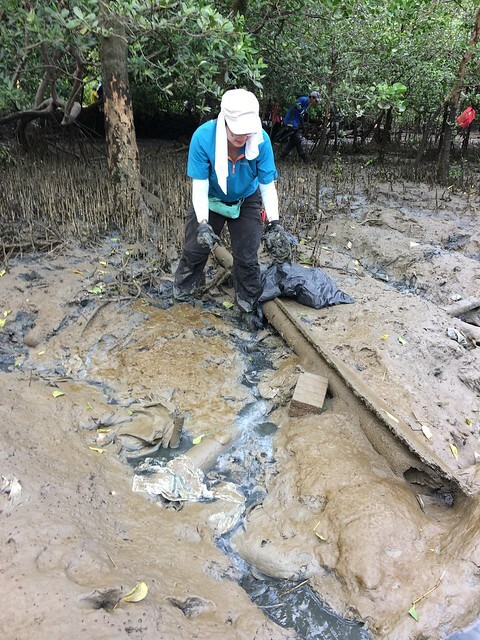 We worked hard in this polluted stream to remove embedded plastic bags – the stream was still host to many crabs, fish, prawns, mudskippers and even horseshoe crabs, which still mate in the area. Mangrover Theresa Su, the soothing sight of a capable field biologist amidst the mud! Organic pollutants from upstream was trickling down into the stream and raising an awful smell – this stinky organic effluent must be traced back to its source and eliminated. 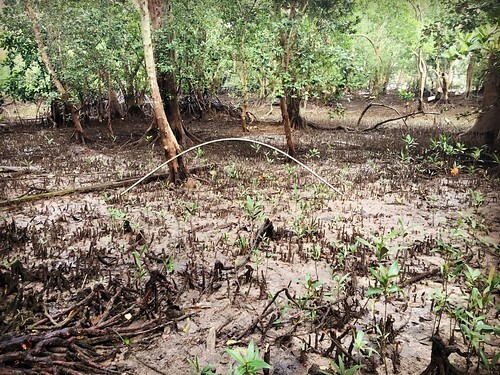 It pollutes the north-western mangroves in many spots, not just Lim Chu Kang East mangrove. Wheelbarrows are critically important in shifting half a ton of trash – we borrowed this from NUS CAPT, used the DBS pickup to bring to over to my RVRC office and rented a GoGoVan to transport it here in the morning – well worth all the effort! They will next be used at Tanah Merah during ICCS on 3rd September 2016. At the Weighing Station, volunteers weight and total up the weighed trash carefully! The weight does not reflect the number of items removed (e.g. a high amount of plastics is not heavy), but provides some indication at least of the amount of trash removed. 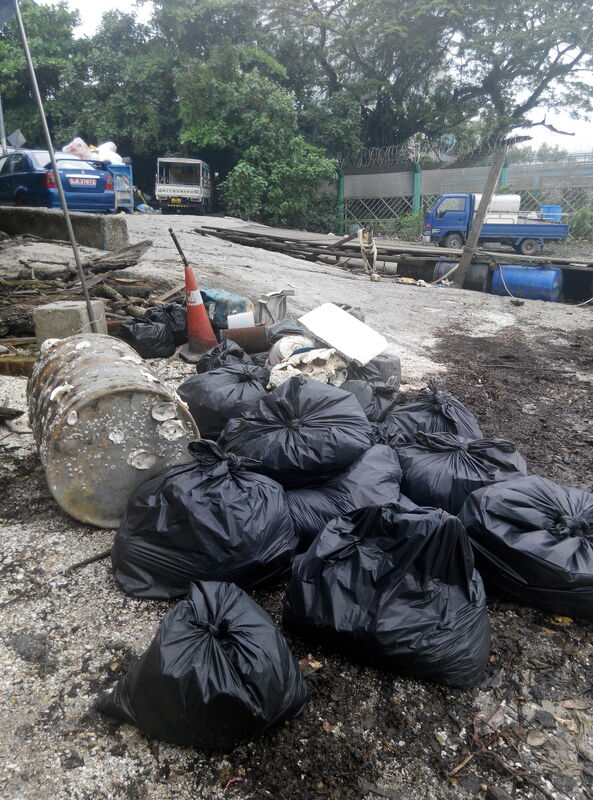 A chain-gang of volunteers moved the accumulated half tonne of mangrove trash to the Trash Disposal Point, and thanks to the National Environment Agency’s Department of Public Cleanliness, their contractor will come at midday to help us with trash removal. 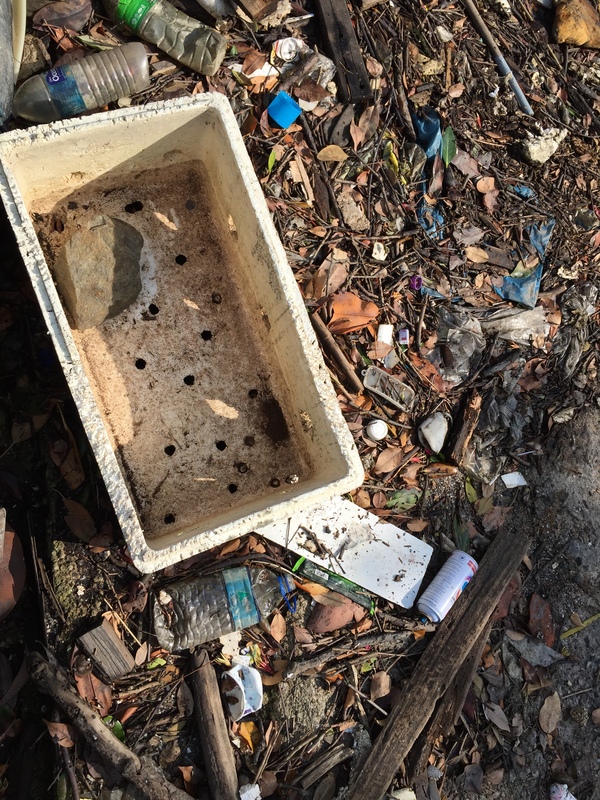 All of such trash in Singapore ends up in an incineration point and its ash ultimately makes its way to the Pulau Semakau landfill the south. Always on hand, my first aid kits were thankfully needed just for one scratch today; sharing the comprehensive advise to participants before the cleanup, the pre-cleanup recce, the safety briefing with critical emphasis at the start, site captains and experienced independents amongst the volunteers, the slow and careful movement by everyone, the thick gloves issued to everyone, and the “gloves on always” rule – all of these help keep cleanups incident-free. Always head into tough terrain with some help – I was really pleased with the 11 @nustoddycats who stepped up to be site captains when summoned that morning – they kept everyone safe in the tough terrain! Here, my former honours students are lined up chronologically – Maria, sister of Theresa Su (Hons 2009), Xu Weiting (Hons 2010), Fung Tze Kwan (Hons 2011) & Amanda Tan (Hons 2012). 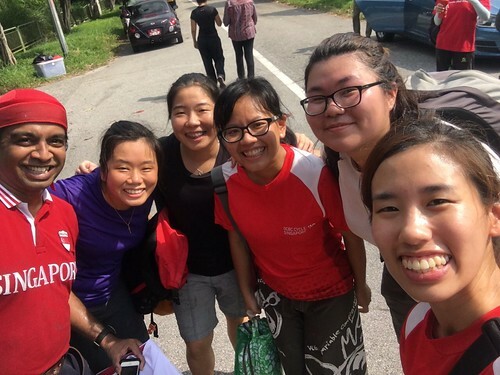 Hearty greetings for Singapore’ 51st National Day in the sun from the wonderful volunteers! 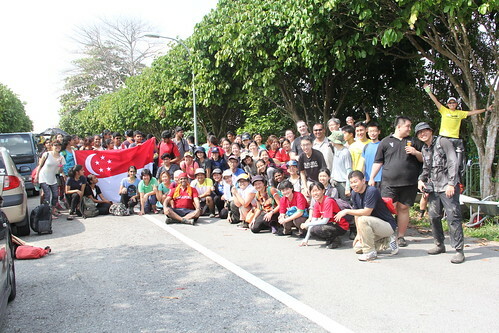 78 volunteers gathered at the end of Lim Chu Kang Road at 8.00am on a Saturday morning on 27th February 2016. 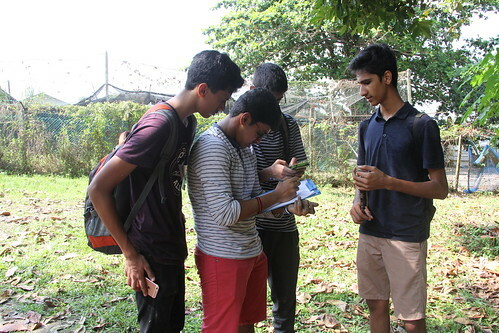 Led by environment club NTU Earthlink, the 47 students were joined by 11 staff of Singapore Pools and 20 independents (members of public and ICCS). 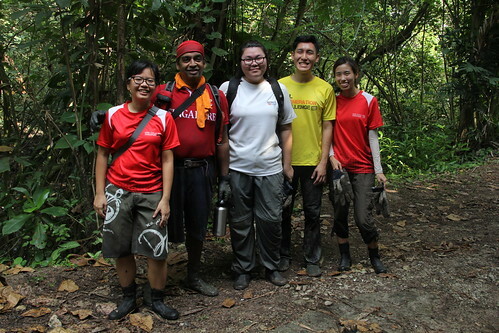 NTU Earthlink’s Nature Guiding Director Wong Zhi Sian carefully went through the operation procedure and safety briefing, and identified the first aider for the day. Gloves and trash bags were handed and volunteers were ready for action! 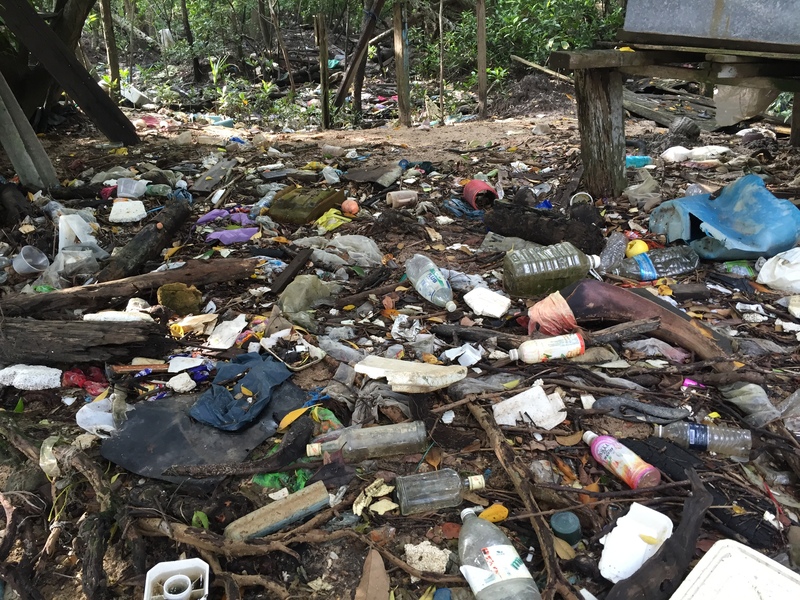 I have been to Lim Chu Kang mangrove several times of cleanups but am still appalled by the sight of the trash which is recruited there! 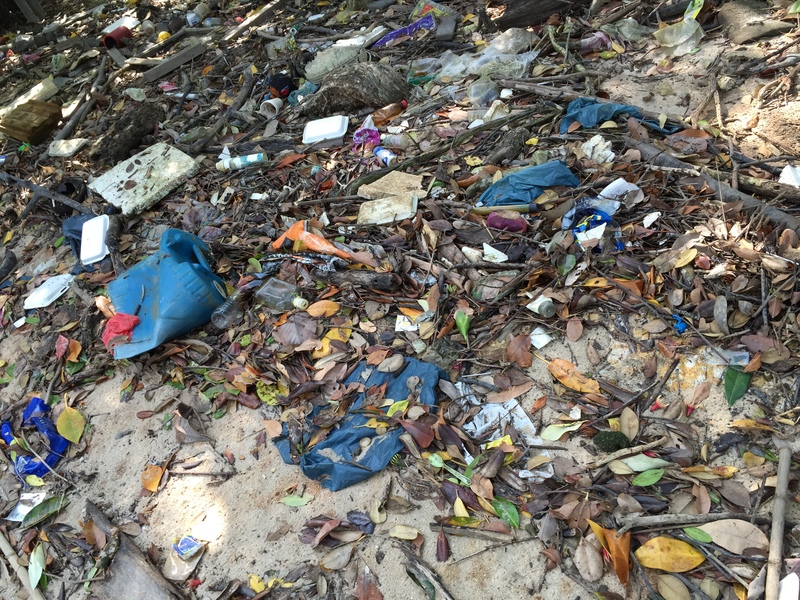 As the landward side is a nature area with no recreation activity, it is the trash load from the Straits of Johor which is brought in by incoming currents. Bulky items such as chairs, barrels, canoes and fishing nets, often pepper the mangrove, possibly abandoned by the fishermen operating both near shore and offshore. 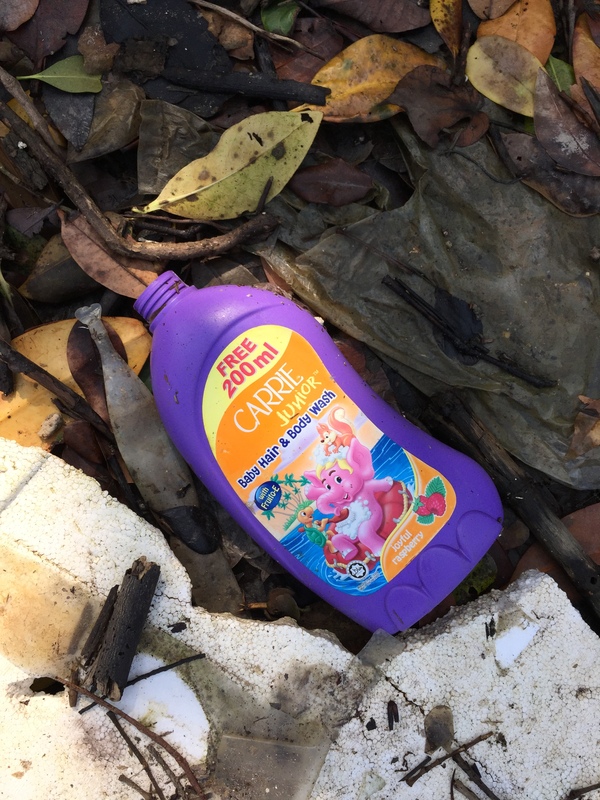 Trash at the Lim Chu Kang Mangrove. 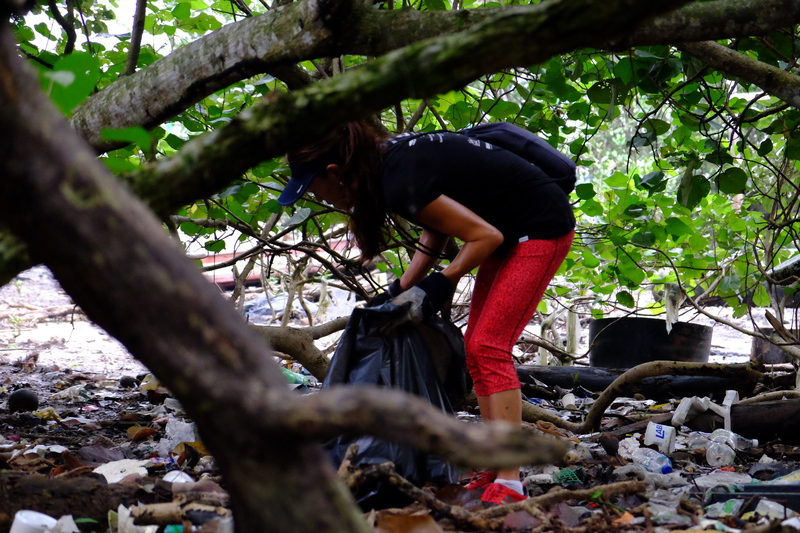 Most of the team worked the sandy beach which was heavily polluted with macro-trash – especially numerous were straws, plastic bottles and styrofoam pieces. Two fishing nets (about 3m in length) were also removed. 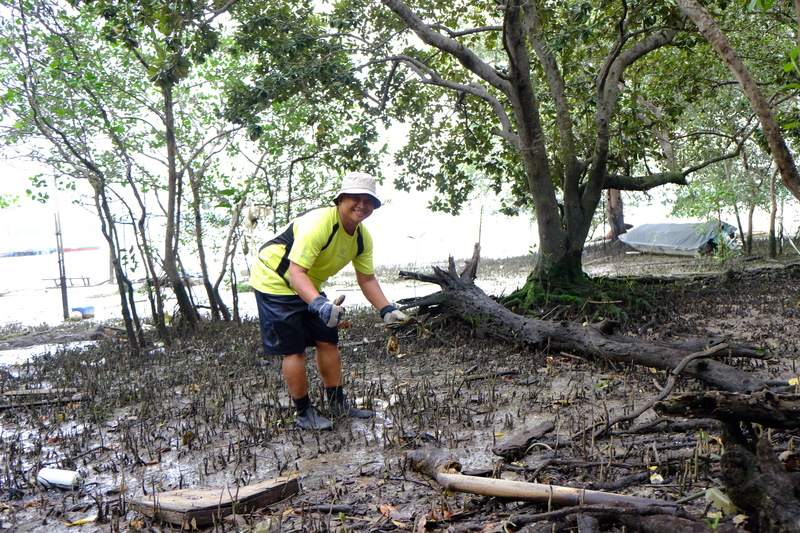 With the help of the North-West Zone Captain Adriane Lee, seven other volunteers successfully untangled, removed and transported one of the fishing nets out of the mangrove. This took approximately half an hour, phew! Look at our happy volunteers! The curse of plastic straws! Say no to single use disposable straws, please. Eight volunteers transporting a massive trash. Volunteers and North-West Zone Captain, Adriane Lee, removing a fishing net. After an excellent two hours of cleanup (60 minutes for a year-round cleanup is typical), volunteers formed a human chain to move the trash bags to Weighing Point and then to the Trash Disposal Point. 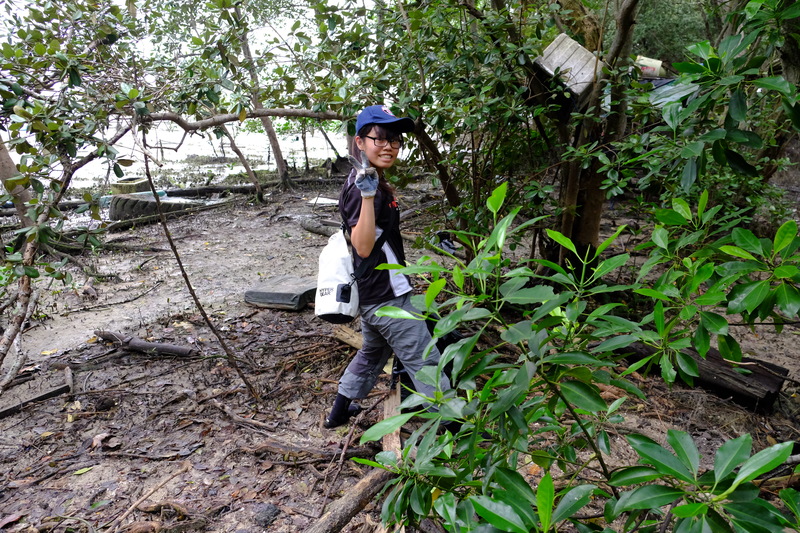 After some quick calculations, Zhi Sian cheerfully announced that we removed a total of 982.5kg of trash from the mangrove. What a great contribution, volunteers! Transporting trash via a human chain made our work easier. Thank you for an excellent contribution to protecting the environment, NTU Earthlink, Singapore Pools and Independents! 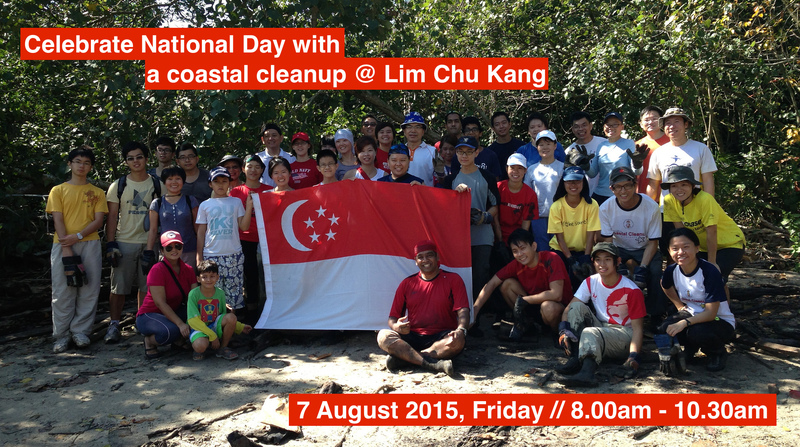 Celebrate National Day with a Coastal Cleanup @ Lim Chu Kang beach and mangrove (Fri 07 Aug 2015)! 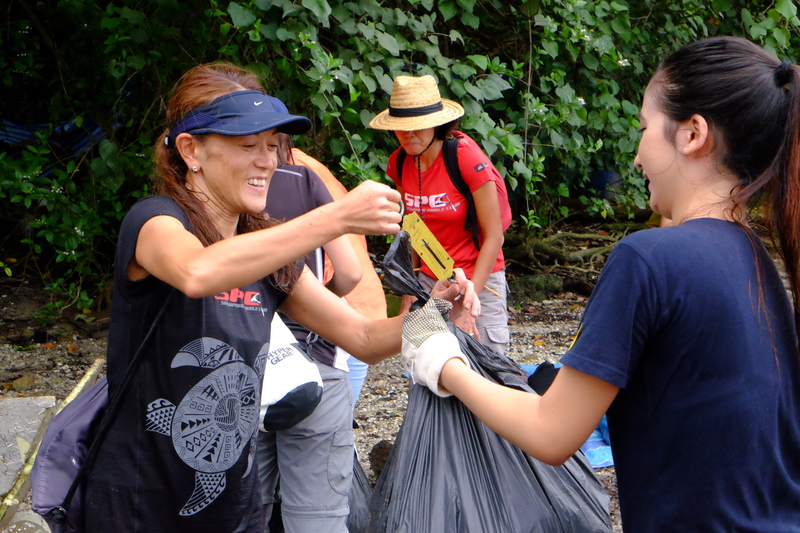 Singapore celebrates her 50th year of independence in August and once again, volunteers with the International Coastal Cleanup Singapore (ICCS) celebrate National Day with a Coastal Cleanup @ Lim Chu Kang beach and mangrove. This time we are working on first day of the Jubilee Weekend – Friday 7th Aug 2015: 8.00am – 10.30am. 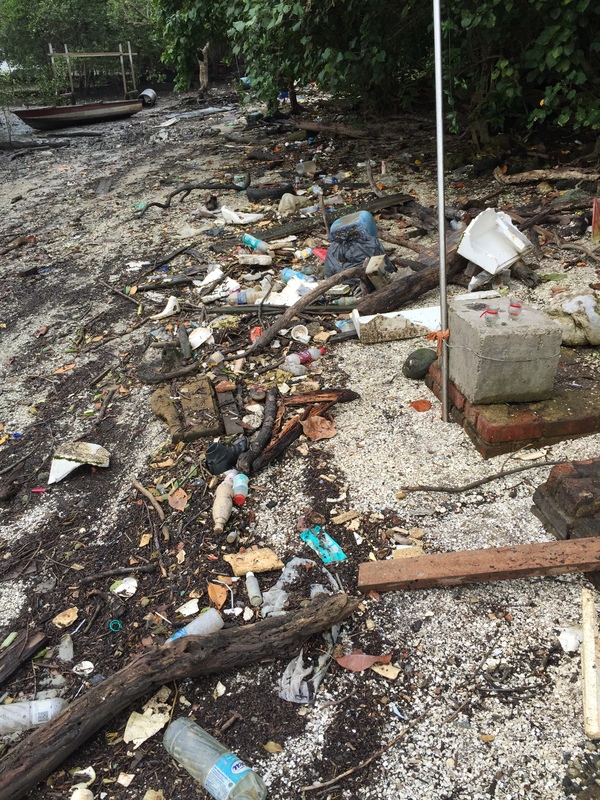 Why do we conduct coastal cleanups? 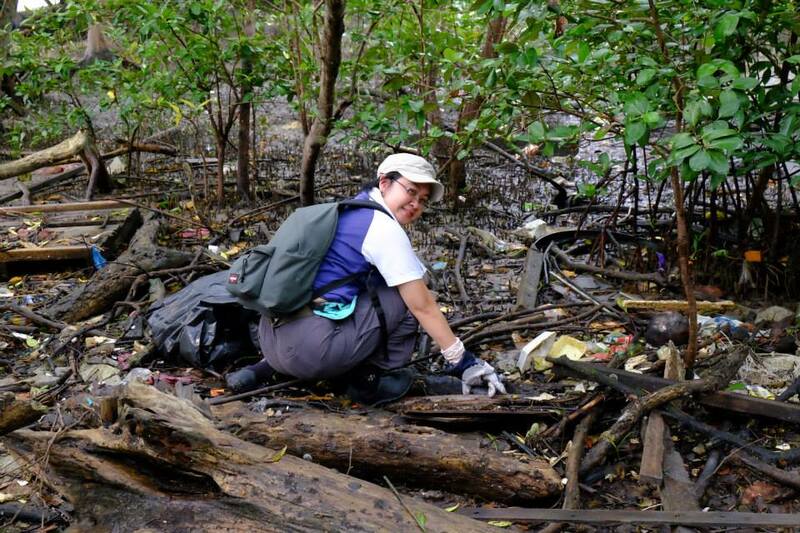 Habitats along Singapore’s coastlines host an amazing biodiversity and trash present in these areas impact our wildlife adversely and devalue the natural beauty of the landscape. Coastal cleanups conducted by volunteers around the world remove this trash, raise awareness about the impact of marine trash, and motivate us to work towards solutions. including sustainable daily practises. Lim Chu Kang beach and mangrove is an unprotected but precious patch of wetland, located in the northwest of Singapore. Incoming trash from the Johor Straits is regularly deposited on the shoreline and impacts the animals, plants and the organisms of the ecosystem there. 08.15am – Bus arrives at the Lim Chu Kang Road end. Apply insect repellant, collect gloves and trash bags. Safety and procedure briefing. 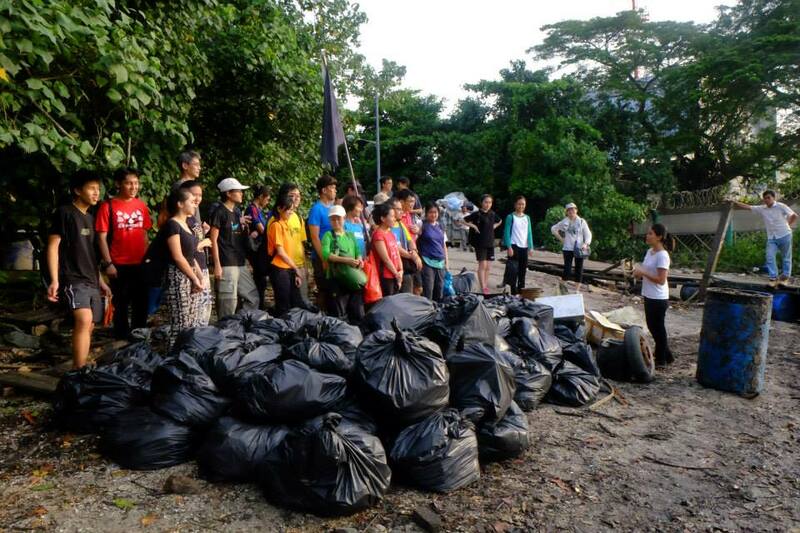 09.45am – End of cleanup; transport trash bags to TCP. 10.00am – Trash is weighed followed by the debrief. 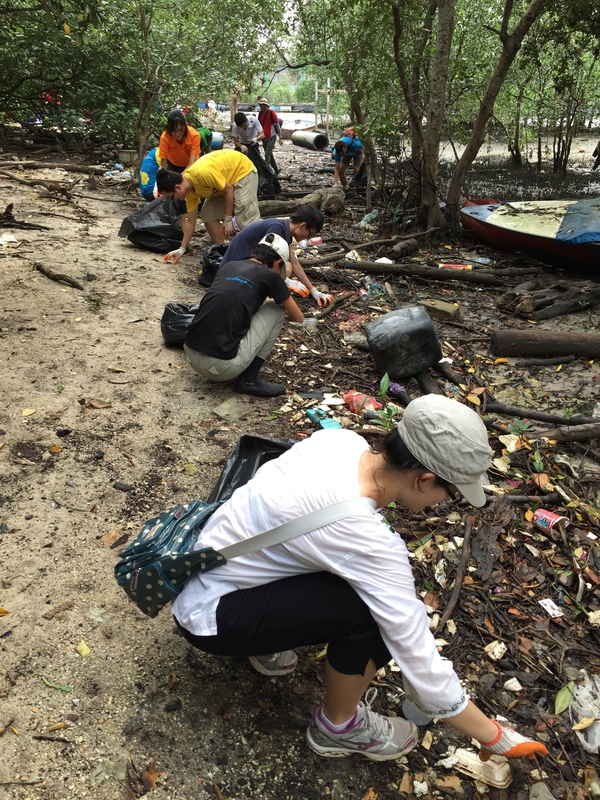 10.15am – Participants clean up. There are no public amenities in this area. Your legs must be clean to enter the bus. 10.30am – Bus departs for Kranji MRT. 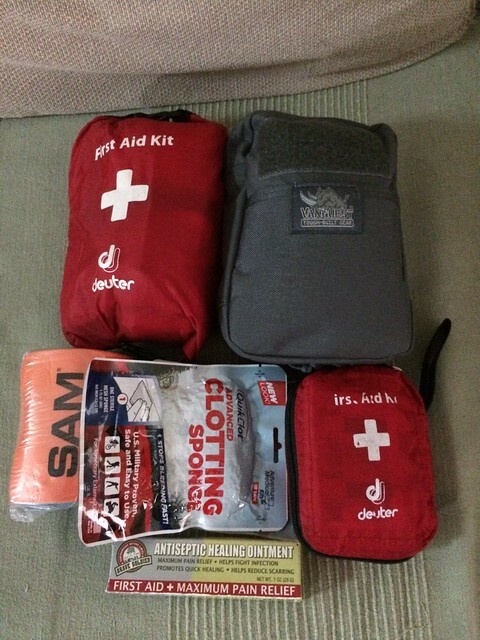 Transport to Lim Chu Kang Beach, gloves, trash bags and weighing scales are provided. You must wear hard-soled covered shoes or booties to to protect your feet from hazards, else you cannot work in the area. A change of clothes is recommended after a sweaty workout. You must be clea to enter the bus – bring a cloth and extra water to do this. Long pants are recommended to protect your legs from insect bites. Refer to this recce report of Lim Chu Kang beach and mangrove. 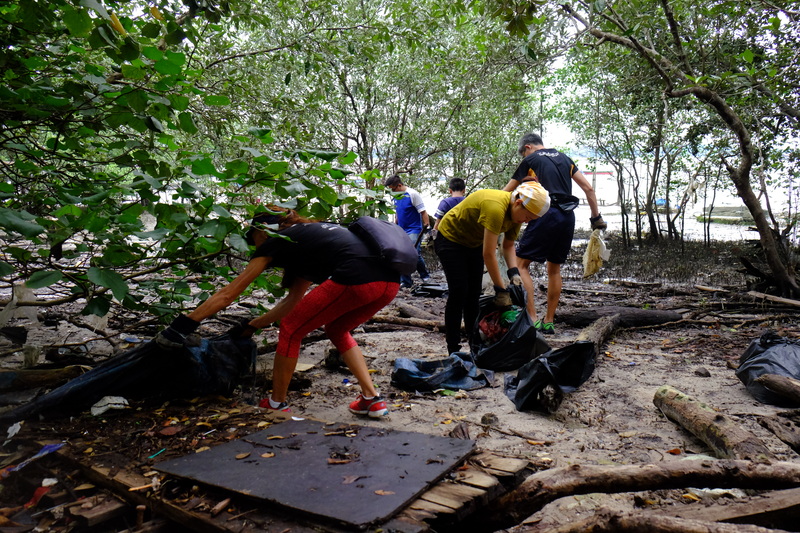 On 3 May 2015, 29 volunteers went with us to Lim Chu Kang Beach during “Operation WE (coastal) Clean Up!” and removed 892kg of trash. 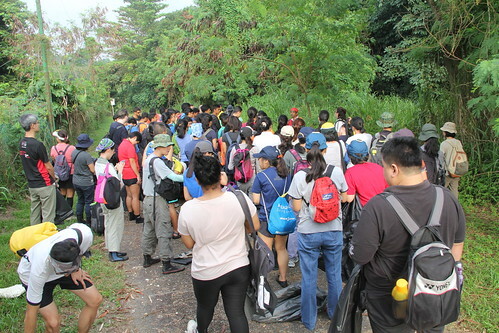 2 weeks later, 32 of us headed down to Lim Chu Kang Beach again in commemoration of World Biodiversity Day and in 76 trash bags, removed 518kg worth of marine trash. 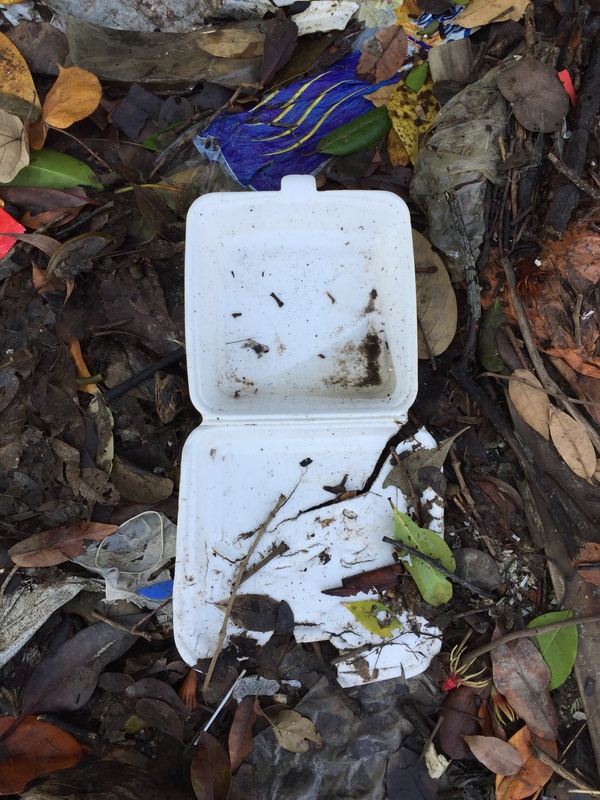 Despite removing a huge trash load 2 weeks ago, Lim Chu Kang beach was once again littered with plastics and styrofoam when we returned on Saturday evening. 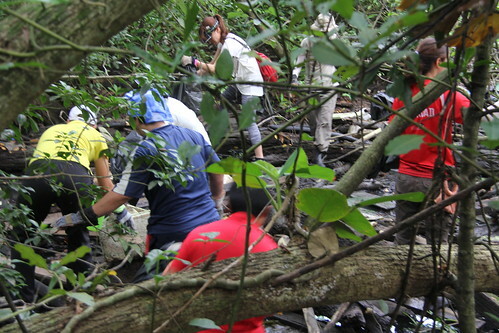 Everyone working hard to free the mudflat of trash. Although only 2 weeks has passed since our last cleanup, we still collected another 518kg worth of trash comprising of items like plastic bottles, plastic bags, food wrappers and styrofoam pieces. This is only a tiny fraction of the trash that is polluting our oceans and coastal habitats. Where does this trash come from? The production of plastic has soared since it first started getting produced in the 1950s, and in 2013 we were producing 299 million tonnes of plastic globally. As a lightweight and versatile material, plastic is no doubt an extremely useful invention. However, single use plastic items can end up accumulating in landfills or littering our beaches and mangroves. 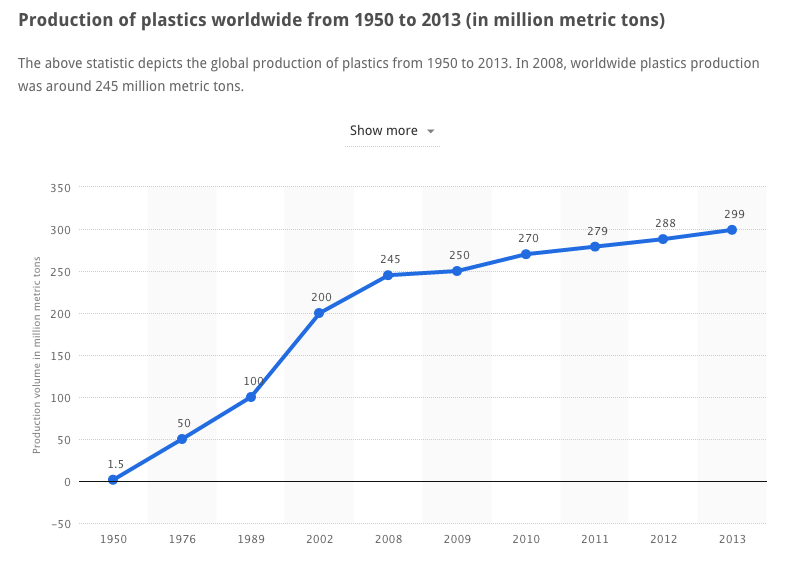 The production of plastic soaring from the 1950s to 2013. Source: statista.com, 2013. 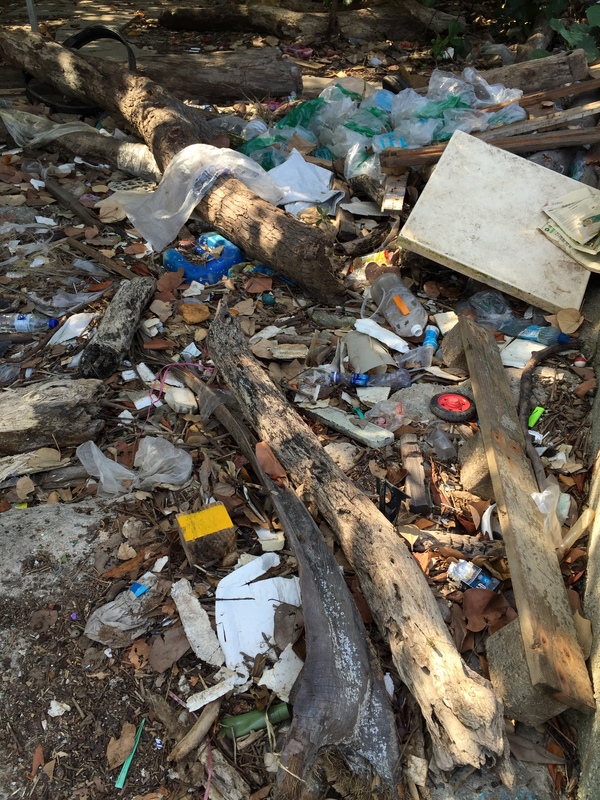 Coastal cleanups can only do so much to lighten the burden of trash on our coastal environment. What can we do to address plastic pollution in our daily lives? Start small by rejecting single-use plastics like straws when buying iced drinks. Bring your own tumbler or coffee mug when you takeaway your morning coffee, or use your own lunchbox when you buy takeaway meals. These are easy things we can do to reduce our impact on our environment. Say no to single-use plastics, and spread the word of sustainability to your family and friends! We ended the cleanup with a debrief where we discussed actions we can take on to reduce our use of disposables. 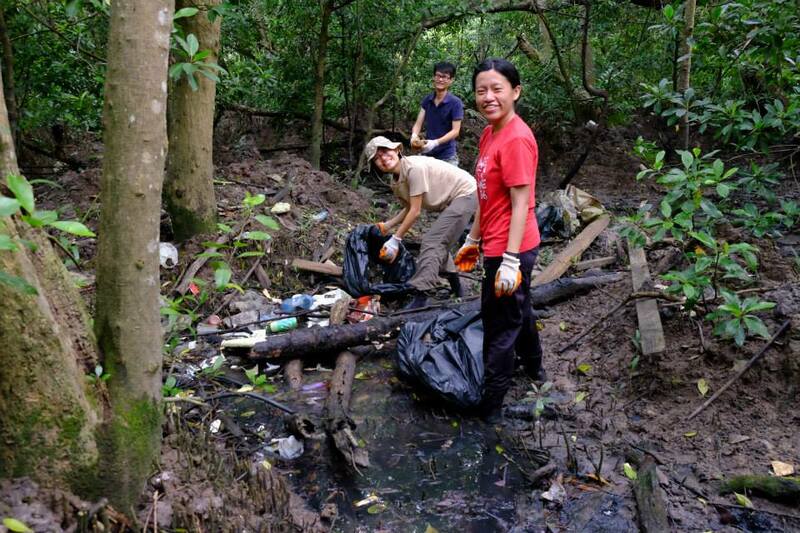 Thank you to everyone who came down on World Biodiversity Day, it was a great effort in caring for our Lim Chu Kang mudflats! 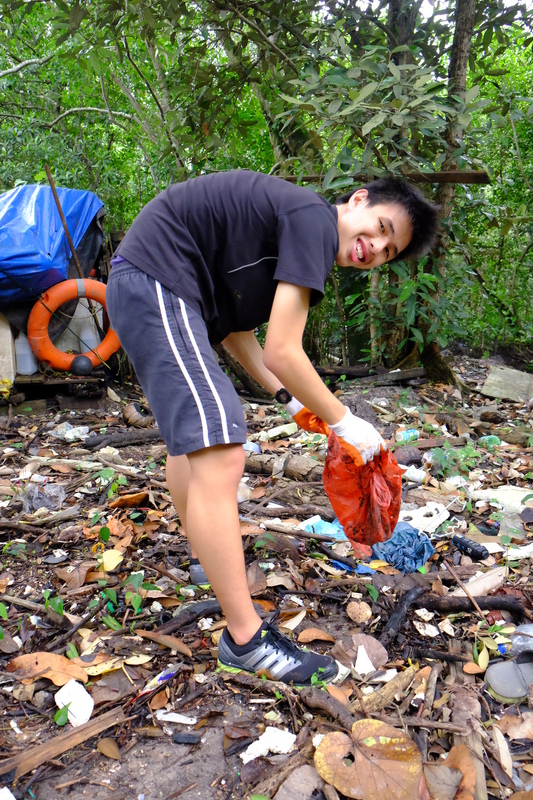 Celebrate World Biodiversity Day with a coastal cleanup @ Lim Chu Kang Beach! 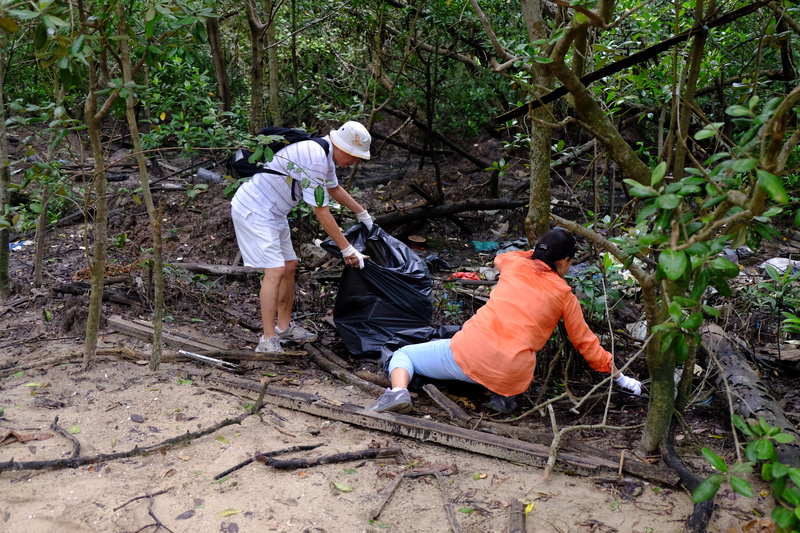 In conjunction with World Biodiversity Day, volunteers with the International Coastal Cleanup Singapore (ICCS) will be conducting a cleanup at Lim Chu Kang Beach on Saturday, 16 May 2015: 4.00pm – 6.30pm. Registration has closed, thank you to all those that signed up! World Biodiversity Day is a day sanctioned by the United Nations (UN) that aims to increase understanding and awareness of biodiversity issues. Why Cleanup? In Singapore, our coastlines host a vast amount of biodiversity. Trash present in these areas can impact our wildlife adversely and devalue the natural beauty of the landscape. Coastal cleanups are conducted by volunteers around the world to remove this trash, raise awareness on the impact of marine trash, and motivate us to rethink our habits in daily urban living towards sustainable practises. Lim Chu Kang Beach is located in the Northwest of Singapore, next to Lim Chu Kang Jetty. 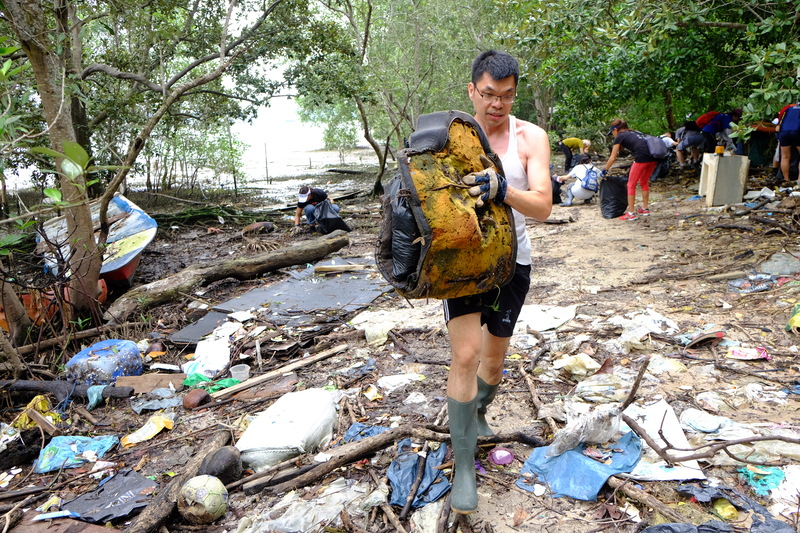 Trash from the Johor Straits is regularly deposited on Lim Chu Kang beach and mangrove. 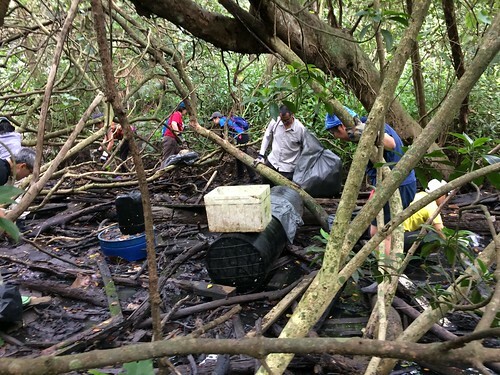 The mangrove is an area where trash accumulates, which impacts wildlife in the area. 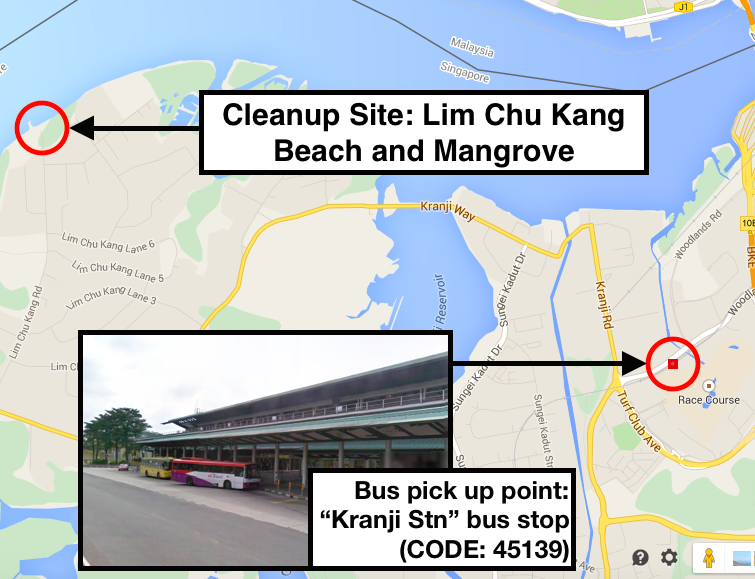 Meeting Point: Participants can meet at the bus stop outside Kranji MRT (Bus code: 45139) and will be transported to the cleanup site at Lim Chu Kang Beach. 15:45 – Arrive at the end of Lim Chu Kang Road. 16:50 – Briefing and identification of Trash Collection Point (TCP). Brief of wet weather plans (which is to carry on unless there is a lighting threat). Organise everyone into groups of 4, apply insect repellant, collect gloves, trash bags, and other required logistics. 17:30 – Transportation of trash to TCP. 18:00 – End of clean-up. Trash is weighed and discussion/ reflection time. 18:15 – Participants clean up. Note that there are no recreational facilities nearby. 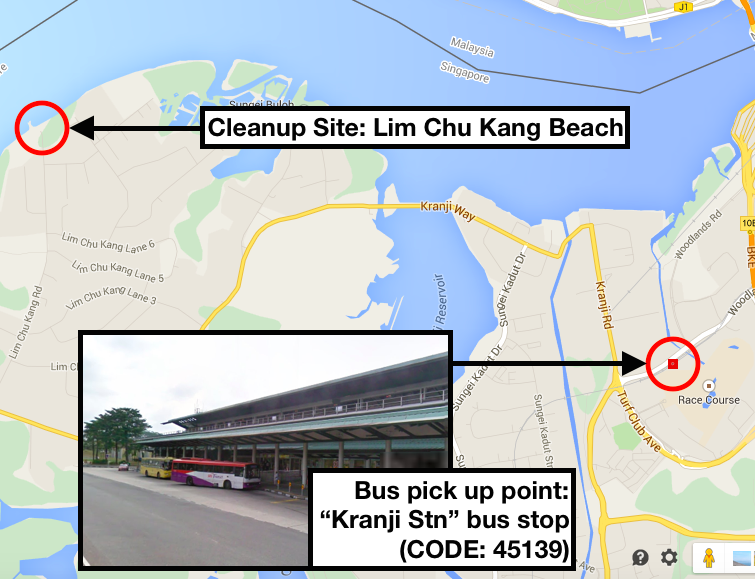 18:30 – Bus will transport participants from cleanup site back to Kranji MRT. You must wear hard-soled covered shoes or booties to to protect your feet from hazards. Long pants are recommended to protect your legs from insect bites, but bermudas are fine. In the event of bad weather, we will continue the cleanup. The event will stop in the case of lightning threat. Have a decent lunch – it’s hard work! Be punctual – we are unable to wait for latecomers; tide waits for no one! 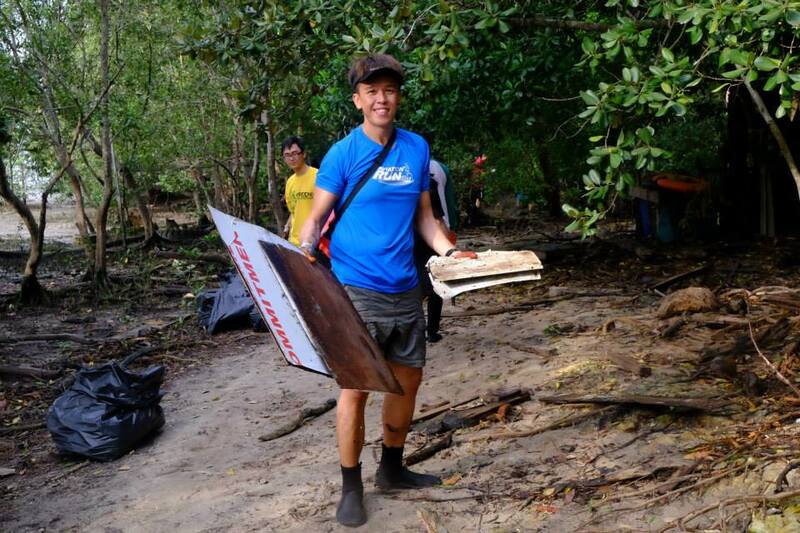 Refer to this recce report of Lim Chu Kang Beach for more information on the cleanup site. 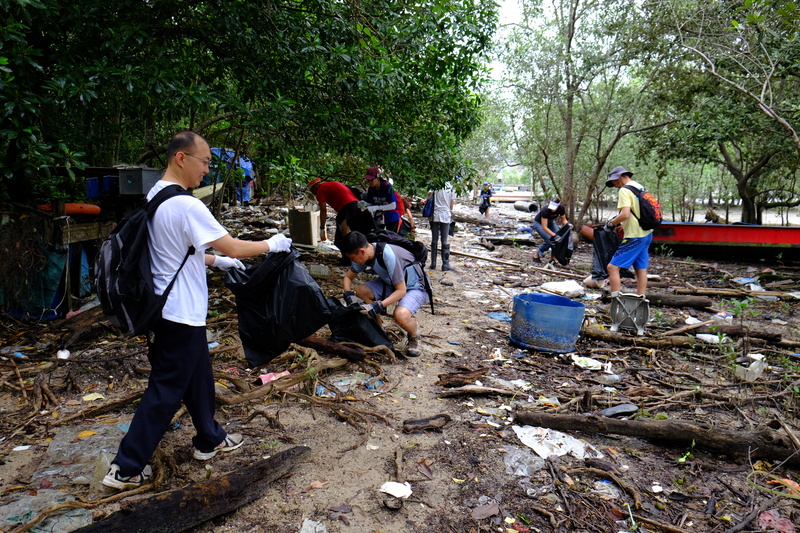 3 May 2015 – 29 individuals from all over Singapore hit Lim Chu Kang Beach in conjunction with “Operation WE Clean Up!,” a movement led by the Public Hygiene Council (PHC). Volunteers removed more than 892kg worth of trash, excluding many jerrycans, oil drums, large blue containers, and tyres! Left: Hauling back the remnants of a sofa back to the trash collection point. Kudos to these two girls worked hard to remove all the pieces of plastic and styrofoam throughout the cleanup, and didn’t want to stop even when the cleanup was over! Left: Maludin, our ICCS South Zone Captain! The weighing of trash was efficient, and done surprisingly fast due to good coordination and teamwork! We ended the cleanup session with a debrief, during which we discussed the 5 Gyres, sites of massive plastic accumulation in slow rotating currents within oceans around the world. Plastics in these places can remain there for decades to come. We also talked about microplastics in the environment, and explained the dangers of such small plastic microbeads in the oceans. These fragments, which can be broken down into sizes of less than 2mm, can be ingested by plankton. Plankton is ingested by fish, and as we consume seafood, the toxins from these plastics eventually find their way up the food chain onto our dinner plates. 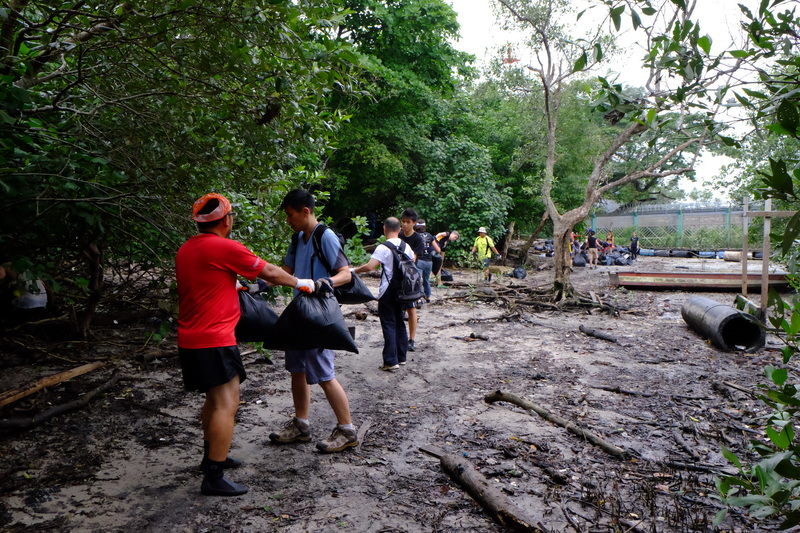 A big thank you to everyone who came down to make Lim Chu Kang a much cleaner place, especially to those who have been attending our 2015 coastal cleanups regularly. We look forward to meeting everyone at our next cleanup!